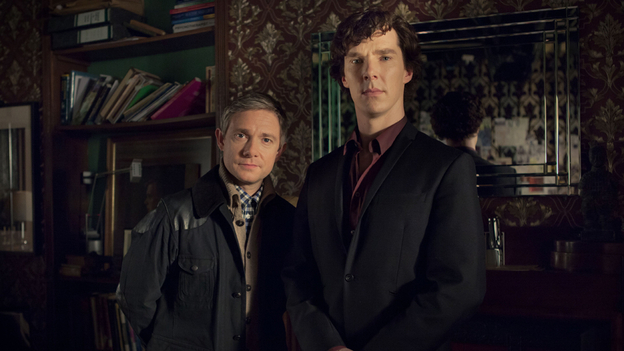 The Sherlock one-off special is currently set to begin filming very soon – in January 2015 to be precise. And, given how soon that’s starting, we actually know comparatively little about the episode, or what stories it will feature. Well, happily, we now know a little (a very, precious little) more, thanks to Gatiss, although, as ever, it’s not nearly enough.. Per Gatiss, the special will address the most obvious cliffhanger from Series 3: the actual fate of James Moriarty who, despite having shot himself in the head, was last seen taking over television screens across Britain asking whether we missed him or not. Gatiss apparently assured the Radio Times that the one-off will “completely” solve the Moriarty mystery. He was rather more cagey about whether the special will be the last time we’ll see star Andrew Scott, who plays Moriarty, on the show, simply saying “Well, it's very hard to put a lid on Andrew Scott..."
The other interesting little tidbit is that while the Sherlock one-off special apparently features a story that could work during the holiday season, according to Gatiss there’s no guarantee that the episode will be a true “Christmas” special and air at the end of 2015. This could, of course, be fantastic news for fans starving for any scrap of new material, if in fact the episode should screen in, say, July. Call me cynical, but, as Sherlock Series 4 won’t even begin to film until some as yet undetermined window in late 2015 (the smart money would probably be on some time around mid to late November at the earliest given Cumberbatch’s theater schedule), I personally can’t imagine the BBC not holding the single episode of one of their flagship series that they have for broadcast next year until the holidays. It’s their biggest, splashiest broadcast window – something which I know is weird to Americans, but nevertheless. (Additionally, both Benedict Cumberbatch and Martin Freeman have previously hinted at or referred to a Christmas special, so pick which source you’d like to believe, I guess?) I’d be so happily shocked if I’m wrong about this – so if anybody wants to place their bets on airdates for the Sherlock special, let’s kick that off in the comments. But what of Series 4? We’ve already been told that the next proper full series of Sherlock will be both “phenomenal” (by Cumberbatch) and “devastating” (by Moffat), so it seems safe to say that everyone’s expectations will be sky high by the time we actually see this in (we hope) 2016. And now, Gatiss has also weighed in, declaring that as far as Series 4 is concerned, “You can always expect tragedy as well as adventure, that’s just how it goes." The bulk of speculation around this particular predictor of Series 4 “tragedy” seems to be focused on whether this means John’s wife/secret assassin Mary will meet her Sir Arthur Conan Doyle-mandated fate of death this season, or whether the Sherlock creators will keep her (and I guess maybe a baby we don’t know yet) around a bit longer. While Freeman seemed pretty adamant that Mary’s a goner during an interview with the Telegraph earlier this year, Gatiss was (surprise, surprise) more coy during his RT chat. My personal prediction? Mary’s still a goner, but as they’ve gone to the extra effort to make her into this crack-shot assassin person, her death will be a bit more dramatic than her textual counterparts (who died offscreen – offpage? – in the gap between two Holmes stories). Other than that, I’m a bit afraid to speculate as to what additional “tragedies” could ensue for the Baker Street boys. I mean, we already did torture, emotional manipulation, resurrection and murder last season. Any predictions about what we’ll see in either the Sherlock special or Series 4?